The Senior Rater Potential Evaluation (SRPE) is first and foremost a tool to help civilian workforce employees identify their leadership strengths and weaknesses in regard to a set of competencies required by professionals in leadership positions. It’s just one component of the U.S. Army Acquisition Support Center’s efforts to develop a highly qualified acquisition, logistics and technology (AL&T) workforce. Employees will use the information in the SRPE to structure continuous learning and an Individual Development Plan that maximizes their potential for performance in positions of increased responsibility. Section 1733(a) of the Defense Acquisition Workforce Improvement Act requires that the best-qualified individuals, military or civilian, be selected for acquisition positions. By evaluating and documenting the leadership potential of civilian employees, the SRPE provides a document that allows selection boards to more easily and equitably compare a civilian candidate’s leadership potential with that of a military candidate, as documented on the Senior Rater section of the Officer Evaluation Report. Selecting officials and boards will also use the SRPE to evaluate the leadership potential of candidates for key civilian leadership positions in the AL&T workforce. The SRPE is used to evaluate the potential of civilian employees in designated grades to perform in positions of increased responsibility, whereas the Total Army Personnel Evaluation System and the various personnel demonstration projects evaluate performance associated with current duties and contributions to the mission. This document provides continued guidance on the use of the Army SRPE for the AAW and is complimentary to the SRPE Policy and SRPE Guidance released on July 10, 2015. Effective July 15, 2015, The SRPE will be prepared by senior raters every fiscal year, commencing October 1, 2015 and based on the potential demonstrated during the previous fiscal year (i.e. October 2014 – September 2015). This policy applies to all current and subsequent civilian Army Acquisition Workforce (AAW) members in the grade of GS-12 and higher, broadband equivalents, and their rating officials. This document provides guidance on the use of the Army SRPE for the AAW and is a complementary document to the SRPE Policy. 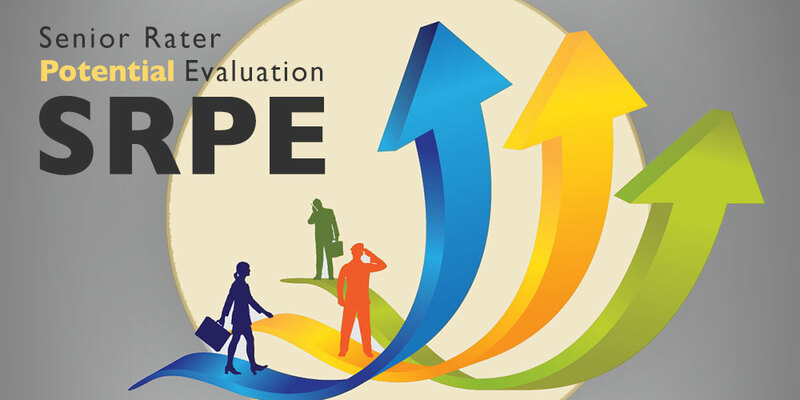 The SRPE is a tool to evaluate the potential of civilian employees in designated grades/broadbands to perform in positions of increased responsibility in special designated senior leadership positions in Board selection programs. The SRPE documents an employee’s leadership potential to serve in positions of increased responsibility and grade. Comments made by the SR are among the most important parts of the SRPE. Therefore, it is imperative that SRs understand its purpose and use language that will accurately and effectively convey the employee’s leadership potential. This guide is intended to assist SRs and is not an authoritative document that must be followed by all. Go to the All FAQs page, and please scroll down to the SRPE section. SRPE Socialization Brief Part 1 provides a background on what is SRPE, why it’s important and roles of responsibilities of each role involved in completing a SRPE. SRPE Systems Brief provides detail screen shots of how to complete an annual, out of cycle and close out SRPE from a Rater and Senior Raters’ lens. Please go to https://rda.altess.army.mil/camp/ and access SRPE instructions by going to “SRPE” tab and then click “SRPE Info” link. The AAW member usage of the system is limited within the SRPE Employee Module. The manual will provide guidance on: Reviewing and providing a digital signature once the SRPE evaluation is completed; Submitting a Reclama document on a completed SRPE evaluation and Viewing and/or Printing a completed SRPE evaluation. Access SRPE instructions by going to “SRPE” tab and then click “SRPE Info” link. The manual will provide guidance to the Supervisor and Senior Rater on the various aspects of the SRPE System and their respective roles. Overview: PEO Combat Support & Combat Service Support employs a centralized, senior rater approach to ensure consistency and improve the value of Senior Rater Potential Evaluations. SRPEs are an important tool in developing future Acquisition career professionals, and is one component of the process (in conjunction with Individual Development Plans) to mentor and advance employees into positions of greater responsibility. PEO CS&CSS uses SRPEs to provide a consistent vehicle to discuss a supervisor’s view of an employee’s strengths, current skill levels, potential training, and/or other experiences. SRPEs are a great mechanism to provide feedback on the employee’s potential for selection into positions of greater responsibility – as compared to peers in his or her broadband and series structure.